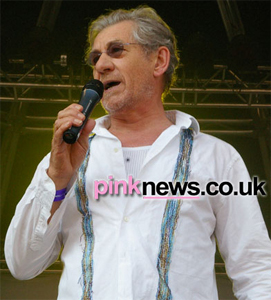 Sir Ian McKellen is to share an exclusive evening with members of Village Drinks, the UK’s leading community group for gay professionals, organisers have confirmed. The event is to be hosted at the Century Members’ Club on Sunday 14th December and is being organised as a charitable venture in aide of the gay homeless charity, the Albert Kennedy Trust (AKT). It will follow the group’s annual Christmas Party being held at the Café de Paris on December 8th. Sir Ian, who is best known for his starring roles in the Lord of the Rings film trilogy, will be taking questions, mixing with the crowd and bringing along some very special guests of this own to meet members of the influential and popular network. He will also give a talk about his life and career. “I am delighted to be lending my support to this special festive evening organised by Village Drinks, whose wide network of influential members can only help to spread the word about AKT and the work it does,” Sir Ian said. Neil Spring, the founder of Village Drinks, said: “We want to use our network to promote the best causes that we possibly can. Village Drinks now has a membership base of 10,000 people, with events running in London, Bristol and Brighton. All ticket monies for this event will be donated to the AKT.